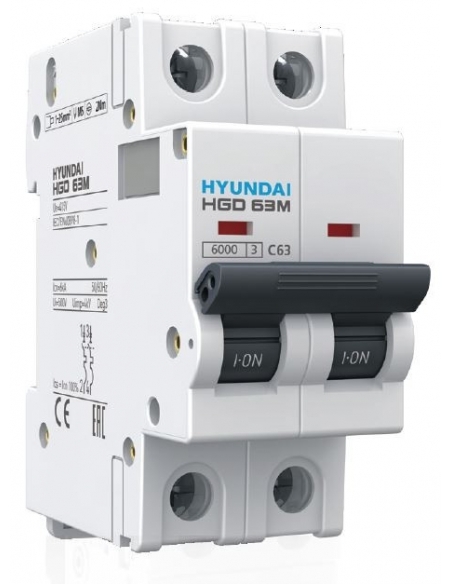 Circuit Breakers (1+N Pole), brand Hyundai, for intensities between 6A and 40A. 1+N Pole Circuit Breaker, 6A for protection against short circuits and overloads in single-phase installations. With an assigned cutting power of 6000A. 1+N pole Circuit Breaker 10A for protection against short circuits and overloads in single-phase installations. With an assigned cutting power of 6000A. 1+N Pole Circuit Breaker, narrow profile, 16A for protection against short circuits and overloads in single-phase installations. With an assigned cutting power of 6000A. 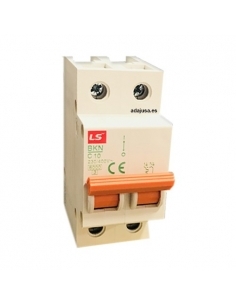 1+N Pole Circuit Breaker , 20A for protection against short circuits and overloads in single-phase installations. With an assigned cutting power of 6000A. 1+N Pole Circuit Breaker, 25A for protection against short circuits and overloads in single-phase installations. With an assigned cutting power of 6000A. 1+N Pole Circuit Breaker , narrow profile, 32A for protection against short circuits and overloads in single-phase installations. With an assigned cutting power of 6000A. 1+N Pole Circuit Breaker, 40A for protection against short circuits and overloads in single-phase installations. With an assigned cutting power of 6000A.